apparently is making a big comeback, according to a recent report in the Los Angeles Times. 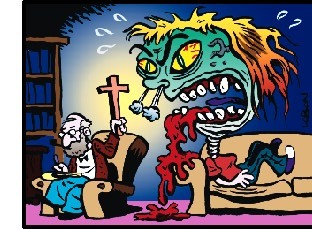 Not that long ago, there were only a handful of honest-to-God exorcists in the United States. But over the past few years, Fordham University Professor Michael Cuneo estimates, the number of exorcism ministries has grown to perhaps 600, some sporting flamboyant names like "Demon Stompers" and others offering exorcisms over the phone--or even over the radio. Exorcism has taken root mostly among evangelical Christians. Yet even the Catholic Church has begun to quietly step back into the exorcism business, appointing more than a dozen official exorcists in the United States. In some ministries, old-fashioned go-demon-into-the-pits-of-Hell exorcism is now supplemented with a hefty dose of pop psychology. At Harvest Rock Church in Pasadena, California, the Times reports, several dozen counselors urge the demon-possessed to examine their past for childhood traumas that might have opened the doors for Satan's forces. Lay pastor Albert Landry says the new techniques offer real hope. "In the early days, we would cast out demons, but we would find they would come right back again," Landry told the Times. "The counseling approach gets to the root of the problem." An Oklahoma high school student says she was suspended from school last December after being accused of casting a magic spell that made one of her teachers sick. According to a lawsuit filed by the American Civil Liberties Union in federal court, the assistant principal of Union Intermediate High School in Broken Arrow, Oklahoma, quite literally conducted a witch hunt against student Brandy Blackbear after discovering she had taken an interest in Wicca. Shortly after one of her teachers fell ill last December, the suit alleges, assistant principal Charlie Bushyhead accused Blackbear "of casting spells causing [the teacher] ... to be sick and to be hospitalized." Bushyhead then told the girl "that she was an immediate threat to the school and summarily suspended her for what he arbitrarily determined to be a disruption of the education process." Lawyers for the school are keeping quiet for now, saying that confidentiality agreements forbid them from responding to questions raised about the case. But Blackbear's parents are speaking up against what they see as ludicrous allegations. "It's hard for me to believe that in the year 2000 I am walking into court to defend my daughter against charges of witchcraft brought by her own school," Blackbear's father told the press. Political power flows from the barrel of a gun, Mao once said. Apparently some Georgia gun nuts agree. On Election Day, two gun shops in the Atlanta suburbs offered gun-loving voters the chance to win a 12-gauge shotgun worth more than $1,000--just for stopping off with proof they'd cast their ballots at the polls. Organizers of the ill-advised gun raffle--the second one in as many editions of the Appall-o-Meter--say they just wanted to increase voter turnout. But a spokesman for Handgun Control called the scheme "incredibly irresponsible."